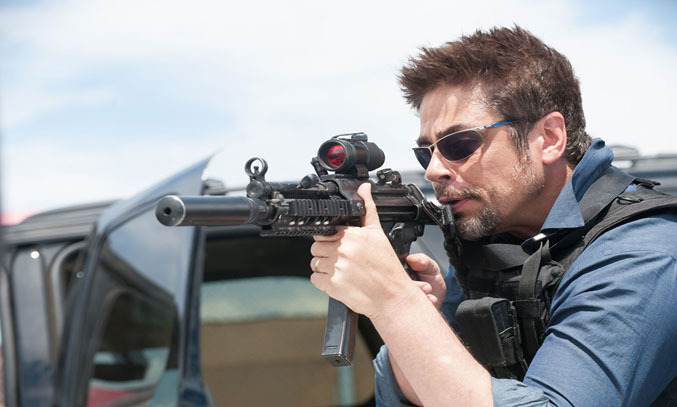 Following its world premiere at the 2015 Cannes Film Festival, Denis Villeneuve’s tightly-woven thriller SICARIO finally hits UK cinemas next month and boy is it good. Written by Taylor Sheridan, SICARIO is a hard-hitting, intelligent crime thriller about the escalating war against drugs. The film tells the story of idealistic FBI agent Kate Macer (Emily Blunt) who is enlisted by a government task official (Josh Brolin) to help track down an anonymous drug lord at the border area between the United States and Mexico. Led by an enigmatic Department of Defense consultant with a questionable past (Benicio Del Toro), the team sets out on a clandestine journey but soon it becomes clear that intelligence-gathering is not the point of the operation and Kate is forced to question everything in order to survive. Complex, brutal and incredibly intense, Villeneuve’s latest drug-trade thriller certainly doesn’t disappoint. Combining action and suspense with emotion and morality, SICARIO is one of the most exciting and technically brilliant films of the year and arguably the best movie about the dominance of drugs since Steven Soderbergh’s Traffic (2000). 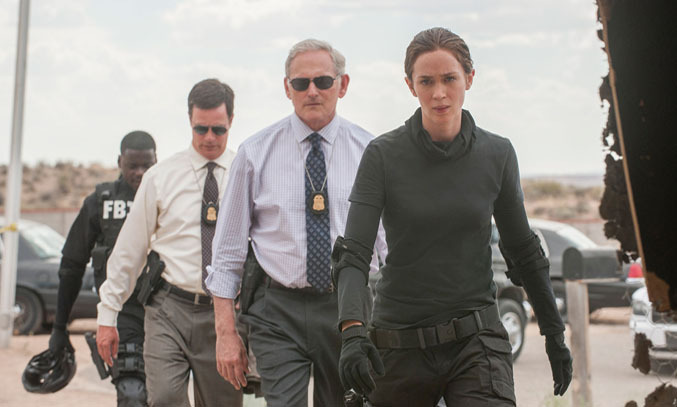 What makes SICARIO so special is that every element of the film works. The script is tightly-woven, hard-edged and incredibly intense. The casting of Emily Blunt, Benicio del Toro and Josh Brolin is inspired. The action scenes are brilliantly staged with the huge convoy scene and subsequent traffic jam fight providing one of the most nail-biting moments of the year. Add to this stunning cinematography from the brilliant twelve times Oscar-nominated Roger Deakins (who, along with Villeneuve, composes some of the most impressive night-vision sequences ever caught on film) and you have one of the best films of year. Action starts in the opening scene with tough SWAT team leader Kate Macer (Emily Blunt) and her team stumbling upon a house of horrors in suburban Phoenix. Villeneuve has said he hates senseless violence in films and this is certainly evident in SICARIO. Villeneuve cleverly plays suspense and imagination to make the already sickening violent scenes, all the more terrifying. One example is a close-up of a floor drain, which is filled with dread as a torture victim’s scream chokes the room. Another is the climatic tunnel set piece which combines claustrophobic horror with sounds of shocking violence. Its extreme, it’s brutal and it’s incredibly intense but it works – and it works well. Emily Blunt (EDGE OF TOMORROW) stars as the Kate Macer, portraying the young but well-respected FBI agent with just the right amount of toughness, bewilderment and vulnerability to deliver one of her best career performances to date. Resolute in her mission, Macer jumps at the chance to join a special task force, headed by Matt (Josh Brolin) but it doesn’t take her long to figure out she’s in over her head. Kate is the only character who seems to care about the legality of their actions and her commanding agents, Matt and Alejandro, are only using her because they need an FBI agent on the scene to cover their tracks legally. Josh Brolin (INHERENT VICE) plays Matt, the Department of Defense “adviser” who seems to carry an enormous amount of clout when he visits Kate’s home office. As story progresses, it becomes clear that Matt’s irresponsible, unprofessional style is work outside the rules of engagement. Benicio Del Toro (SAVAGES) completes the ensemble cast as Alejandro, the utterly calm, blank and emotionless “consultant” who hides a few secrets of his own. Del Toro lurks around the fringes of the action for most of the story but when he does spring into action, it will leave you both shaken and impressed by his beautifully dark work. Dark, complex and technically brilliant, SICARIO is tipped to be a dark-horse contender at this year’s awards season and rightly so. Between its gripping plot, stunning cinematography and superb cast performances, SICARIO is one of the best film this year.